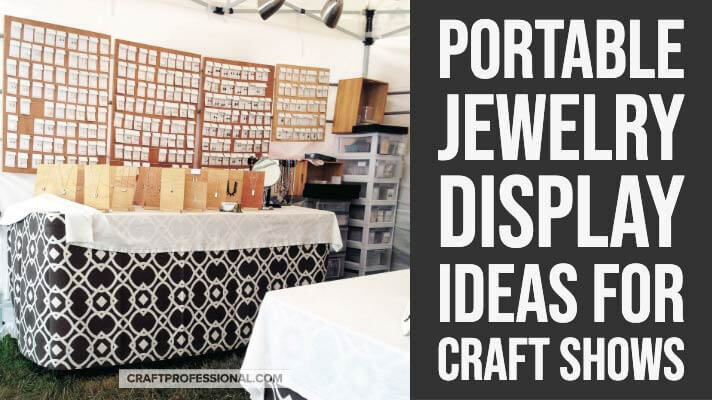 Are you working on creating a portable jewelry display for craft fairs? You're in luck! 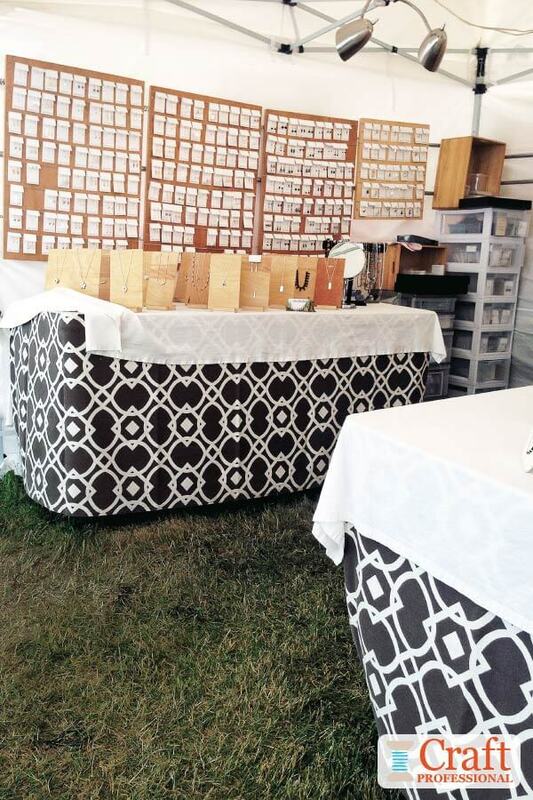 I have lots of gorgeous booth photos to give you ideas and inspiration for creating your own display for craft shows. 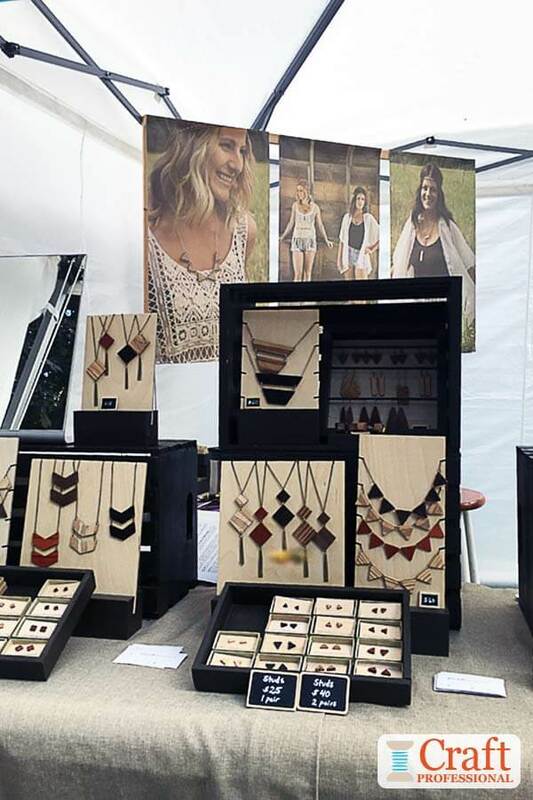 If you're not a jewelry maker, and you're building a different kind of craft booth, be sure to check out these photos, too. With a little bit of creativity, you'll be able to apply a lot of the ideas here for displays of all kinds of small items, not just jewelry. 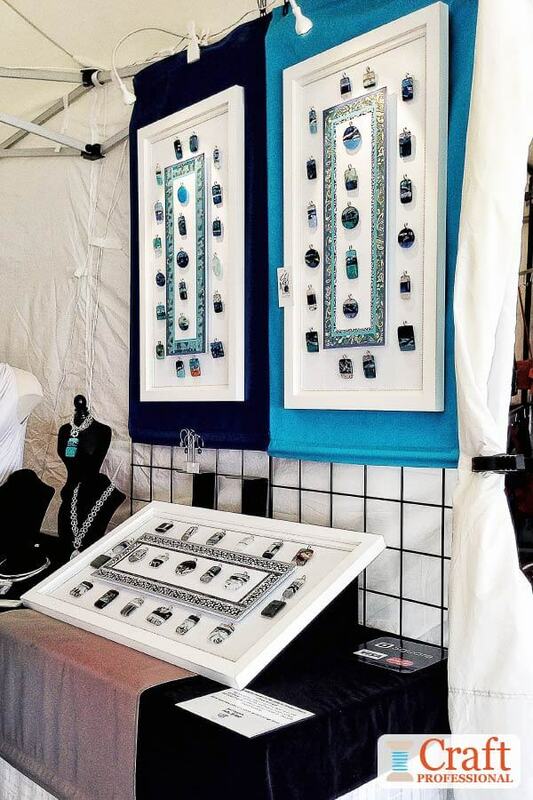 I love this black and white jewelry booth (pictured below) with natural wood display pieces. Customers love it, too. It's always full of shoppers. Below, you can see both sides of the booth. It's a U-shaped setup with tall tables and wood display panels on the walls that makes excellent use of the 10 x 10 booth space. 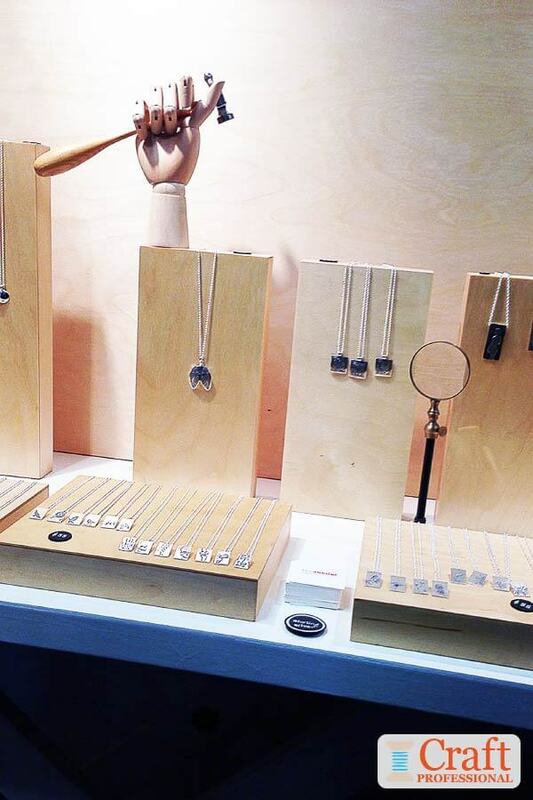 The wood necklace display stands shown in the photo on the left are fantastic. They are a simple and elegant way to display jewelry. You can find similar wood jewelry stands in the Kaizen Woodworks shop on Handmade at Amazon. The bold graphic tablecloths add interest and draw attention from a distance. 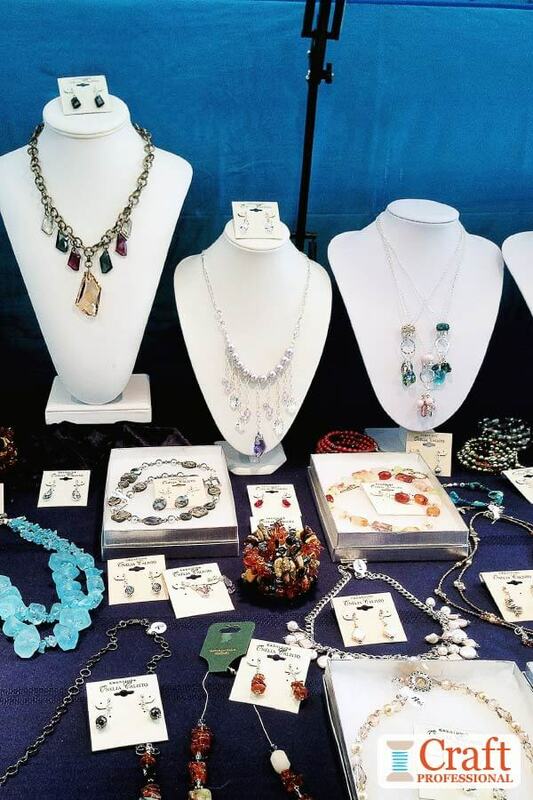 However, the smaller white cloths create a simple, neutral backdrop that allows the jewelry to be the focus as customers approach the booth for a closer look. This portable jewelry display is another favorite of mine. It's so simple and clever, and it's part of another booth that is always packed full of customers. Notice this display uses wood necklace stands that are quite similar to the ones used in the previous booth. The wood blocks sitting on the table provide more display space. They give importance and presence to the pendants. Imagine if the pendants displayed on the flat wood blocks were simply laid out on the table. They wouldn't look nearly as special. But the display is simple, so customers aren't afraid to pick up items to get a closer look. My absolute favorite part of this display is the articulated mannequin hand holding a chasing hammer. It's a brilliant way to add a bit of interest to the display, and show off the tools of the trade. You don't have to be a jewelry artist to use this display idea. Any craft that uses a tool that's small enough to fit in the hand would work. Can You Guess What This Display is Made From? Notice the perfectly sized white jewelry display boards pictured in the jewelry display below. It's such a creative and clever portable display solution. The middle of the door is decorated with colored papers that match the colors of the glass pendants to help bring the look together. 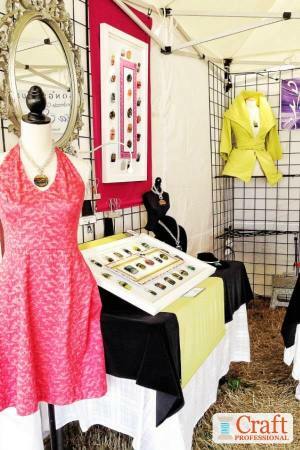 Notice this booth uses color blocking as well, with pendants of like colors grouped together and background fabric and large, colored frames used to highlight each color. You can't see this feature in the photo, but the pendants are attached to the cabinet doors with velcro, making them easy for customers to remove to pick up and look more closely. It's small and discrete, but there's also plenty of good lighting shining directly on the jewelry as well. 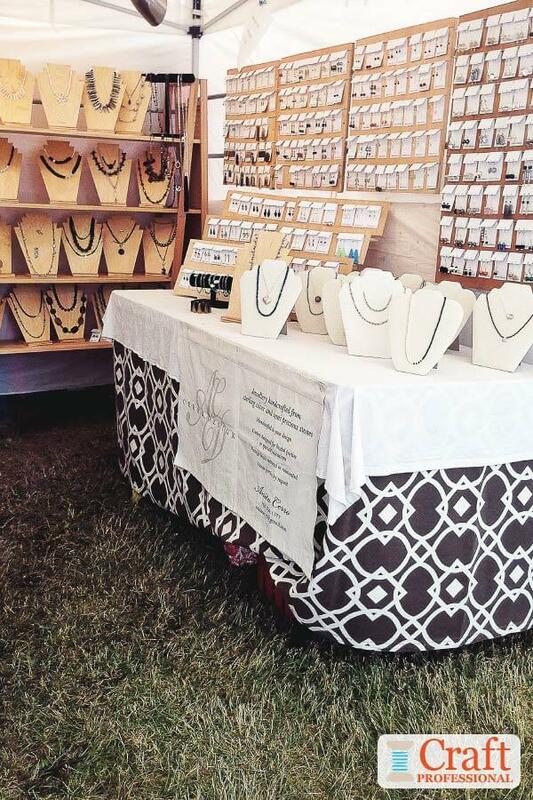 Never underestimate the importance of good lighting in your portable jewelry display. Here's another clever DIY jewelry display idea. Copper pipe is constructed in a U shape, and then secured to a wood base. Pretty, delicate necklaces can easily be hung from the top of the frame. This stand is a simple, and inexpensive way to display necklaces. Also, notice the mirror at the bottom right of the photo. It encourages shoppers to try on their favorite pendants, bringing them one step closer to a purchase. 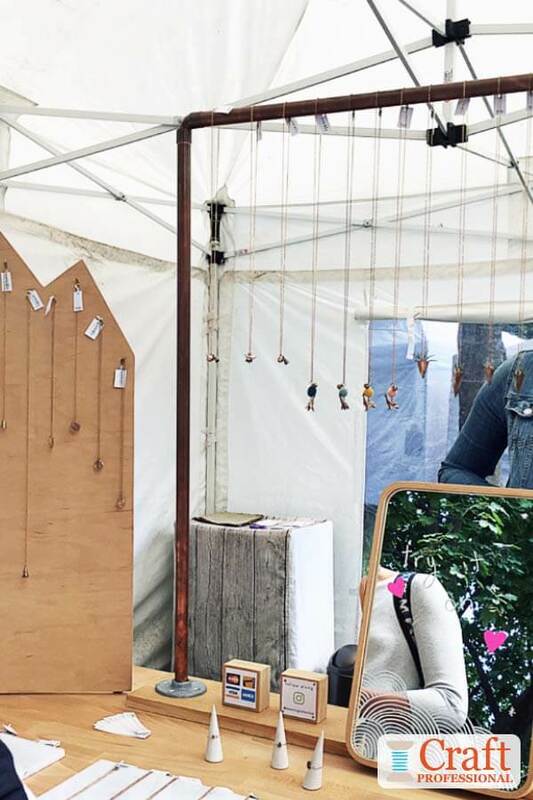 Wood crates are such a practical addition to your craft booth. They provide good display options and can help to create variety in the height of your display. Crates are also fantastic for transporting supplies and for storage when you're not at a show. Crates often have a rustic feel to them, which is suitable for some products. However, this booth is made more sophisticated with crates painted black to work with a color scheme that's consistent throughout the display and the jewelry. I like this next booth because the dark blue background provides an unexpected twist. Most often, you'd choose black if you were trying to create a look with a dark background. The dark blue has all of the richness of black, but it adds a surprising, elegant twist. The white jewelry display busts contrast nicely with the dark blue background. 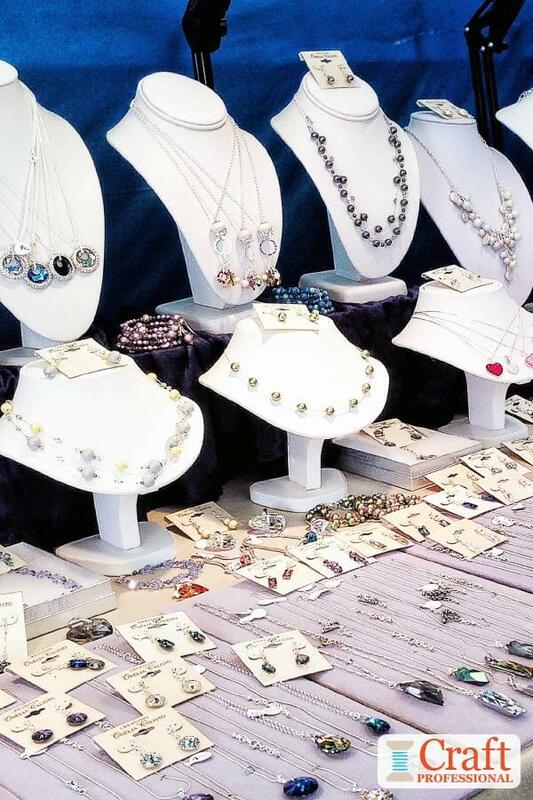 Want to encourage your customers to splurge a little on some new jewelry? Check out these printable craft booth signs in my Etsy shop. Life is short. Buy the jewelry. 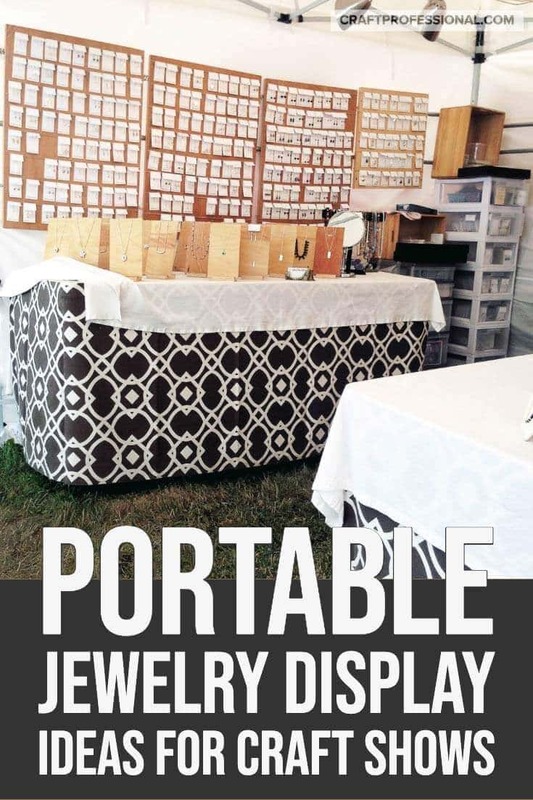 Printable signs for your jewelry booth to encourage customers to splurge a bit.